Let's hear it for juke box musicals! Beautiful, The Carole King Musical, currently on a year-long nationwide tour, is spending most of October at the Kennedy Center where audiences tend to skew middle aged, the demographic that became aware and fond of pop music in the 1960's and 1970's. Carole King's music with the lyrics Gerry Goffin wrote are a splendid reminder of what pop music used to sound like -- melodious with sweet, deeply-felt, intelligible words. No screaming, no electronic rude noises, just lovely tunes that never seem to get old (nor do they give you a head ache.) No wonder the show received so many Tony nominations and walked away with two winners plus a Grammy. The Broadway run continues to do record-breaking business. Given how good the touring production is, Beautiful is on track to please audiences nationwide. Carole King (nee Klein) has an extraordinary talent. Beginning at the age of 16, the daughter of divorced parents, skipping two grades, living in Brooklyn with a nag for a mother (possibly redundant given the locale), she knew from such an early age what she wanted to do and how she wanted to do it. She never sold out. On the contrary, her work which was prolific just kept getting better and better. On her first visit to Don Kirshner (Curt Bouril) a big time record producer, King met Gerry Goffin, a flirtatious chemistry major and lyricist who later suffered what was then called a nervous breakdown but today would be labelled "mental issues." Their partnership both professional and personal produced such memorable heartfelt songs as "Take Good Care of My Baby," "It's Too Late," and "Will You Love Me Tomorrow." Songs flowed from their collaboration -- one hit after another. The office/studio building at 1650 Broadway was where many of rock and roll's best composers, musicians and lyricists hung around together, starting their careers. It was there that Carole King and Gerry Goffin met the totally focused Cynthia Weil and the hypochondriac Barry Mann. The two couples became very good friends and fierce competitors as they watched each other's songs climb Billboard's all-important charts. A move to the suburbs by Carole and Gerry and after their split, a move to LA by Carol, did not diminish the foursome's friendship, love or rivalries. 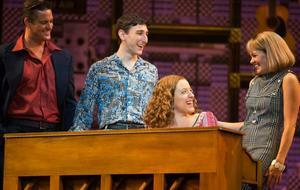 Jessie Mueller originated the part of Carole King. In the touring production the role is played beautifully by her sister, Abby Mueller. Costume designer Alejo Vietti along with wig and hair designer Charles G. Lapointe have made Abby/Carole suitably frumpy. In fact all the costumes, wigs and hairdos fit perfectly the passage of time and styles. Did we really tease our hair into dome-like constructions? Not having seen Jessie's Carole I cannot make a comparison but Abby's performance as a singer and as a pianist is a tour de force. Becky Gulsvig as Cynthia Weil is given a much more buttoned up style. She's tough -- so is Carole but Carole is also vulnerable. Although a bit shrill at times, Gulsvig has excellent comic timing. To portray mental illness is a challenge for any actor. Going over the top ruins pathos but there is none of that in Liam Tobin's Gerry Goffin. He's flirtatious and cocky when he meets Carole; contrite and humble when he meets her at the pinnacle of her career. Some of the best lines belong to Ben Fankhauser's loveably neurotic Barry Mann. All four actors complement each other very well. They are a joy to listen to and watch. The hard-driving Brooklyn mother is something of a cliche in tv sitcoms but Suzanne Grodner delivers Genie Klein's sharp-tongued commentary with wit and style. The vignette, the small character part that gave me the giggles is John Michael Dias's Neil Sedaka. Choreographer Josh Prince has given him just enough sideways knee bends and fluttering arms to bring back memories of those moves and just enough satirizing of the dancing style favored in the '60's. The formula of lead singer plus three backups doing syncopated line dances and turns works well for The Drifters and The Shirelles. Ashley Blanchet is fortunate to play the Goffin's babysitter who also makes it big in the music biz as Little Eva singing and dancing to "The Locomotion." Similar to Jersey Boys in spirit and feel good quotient, Beautiful, The Carole King Music is nothing but pleasure. For a song list see the original review here. Cast: Abby Mueller (Carole King); Suzanne Grodner (Genie Klein); Sarah Bockel (Betty); John Michael Dias (Neil Sedaka); Salisha Thomas (Lucille); Curt Bouril (Don Kirshner); Liam Tobin (Gerry Goffin); Jason A. Dawson, Paris Nix, Noah J. Ricketts, Dashaun Young (The Drifters); Becky Gulsvig (Cynthia Weil); Ben Fankhauser (Barry Mann); Ashley Blanchet, Britney Coleman, Rebecca E. Covington, Salisha Thomas (The Shirelles); Rebecca E. Covington (Janelle Woods); Ashley Blanchet (Little Eva); Andrew Brewer, John Michael Dias (The Righteous Brothers); Ashley Blanchet. Britney Coleman, Salisha Thomas ("One Fine Day" backup singers); Andrew Brewer (Nick); Delaney Westfall (Marilyn Wald); Britney Coleman ("Uptown" singer); John Michael Dias (Lou Adler). Run time: 2 hours and 30 minutes with one 20-minute intermission. Kennedy Center Opera House, Washington, DC; www.kennedy-center.org. 202-467-4600; October 6 -25, 2015; Tickets $39-$185. > Review by Susan Davidson based on October 8, 2015 performance.